I started buying our coffee at The Kaffeeklatsch, 103 Jefferson Street, Huntsville, before my husband T & I were even married, so needless to say we have been customers for a long time! They are located downtown about a mile from where I work, so it is convenient for me to buy coffee there on my lunch break. Grant and Kathy Heath, the owners, are pleasant, friendly people who make buying coffee one of my favorite errands. 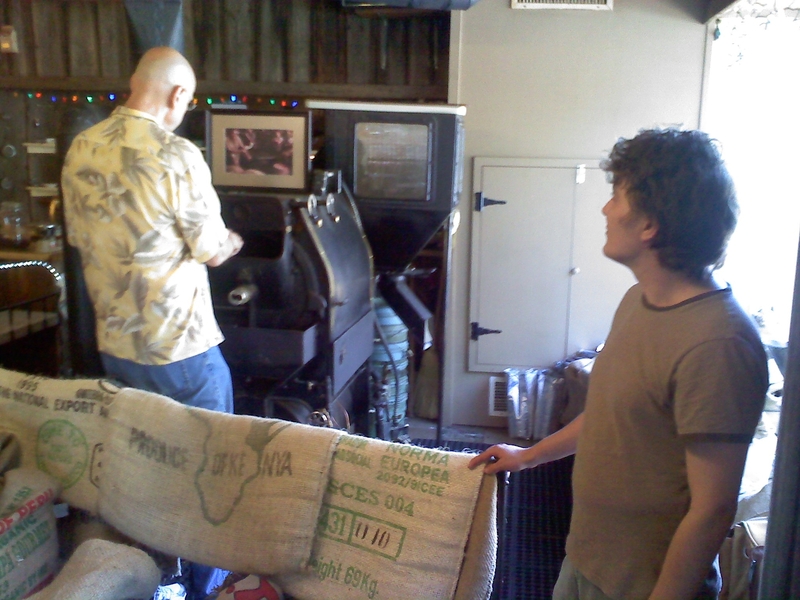 Grant roasts the coffee beans on the premises on a daily basis so they are always fresh. Also, he roasts each variety of bean to the optimum degree to bring out the flavor of the coffee without leaving it with a burnt taste. Does anyone else think Starbucks coffee tastes burnt? No wonder most people choose the sugary, high-calorie coffee drinks over their regular coffee! But I digress… The Kaffeeklatsch is a coffee shop, not a coffee bar, although they usually have brewed coffee available if you’d like a cup. The coffee beans are shipped to the store in large burlap sacks that are decoratively draped near the coffee roaster. 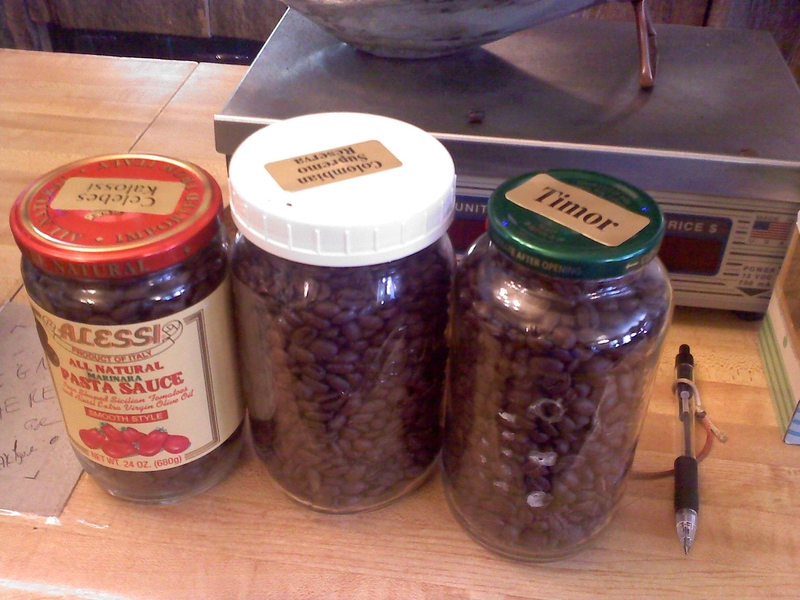 The roasted beans are transferred to large glass jars for storage. 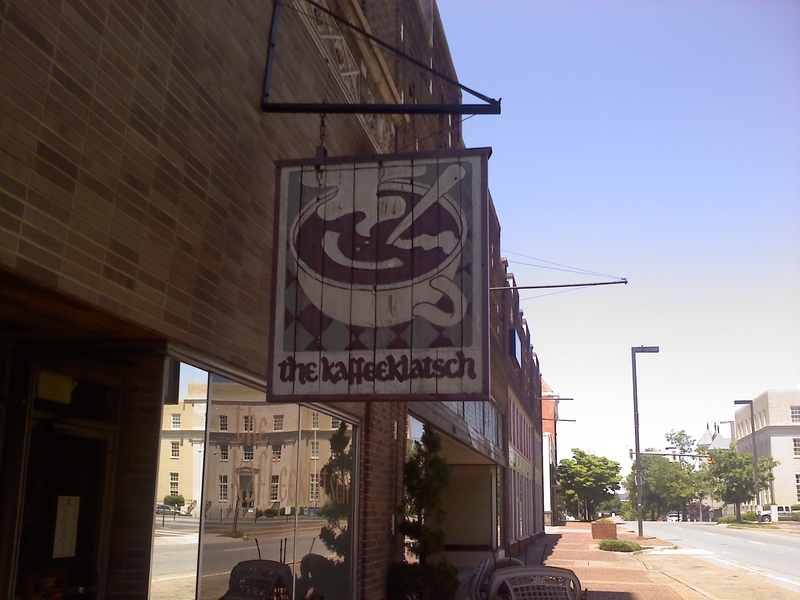 The Kaffeeklatsch also sells a wide variety of loose tea in bulk. Kathy said that they have started asking customers whether or not they need a bag, and that at least half the time people turn down the bag. Many of the coffee varieties are organic, free trade and shade grown. Since they are a small, local store with limited storage space, the beans are fresher than the ones you would get from a national chain. 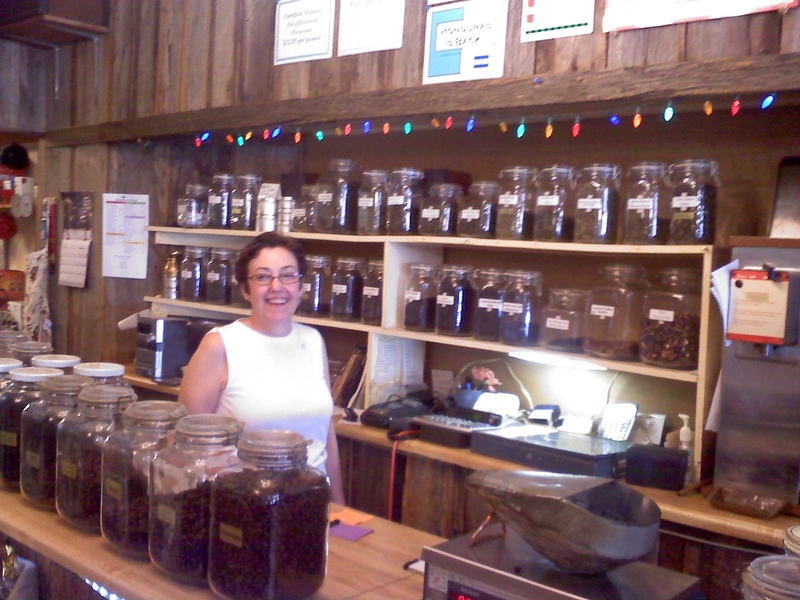 Kathy was happy to fill my glass jars with coffee beans. She said that I was not the first customer to bring in glass jars. She did point out that my jars held between 0.5 and 0.75 pounds, less than a bag would hold, so I may want to bring more jars at a time in the future. This is simply the best coffee in town. The prices are on the higher side, but not unreasonable. Pay attention and you’ll notice that a lot of times the coffee comes in 12oz bags, not 16oz. This is one of the cases of, “you get what you pay for”, which is freshness and quality. Also, since they close at 4, if you can’t get there until later than that, call them and place an order and you can pick it up at the bar next door whenever you get off work.